The mobile phone is now being used for small-time financial activities, such as information on prices and billing settlements. But the important development that service providers and bankers should work towards is to make it drive a retail credit revolution. Telecommunications will emerge as a major competitor to financial institutions. 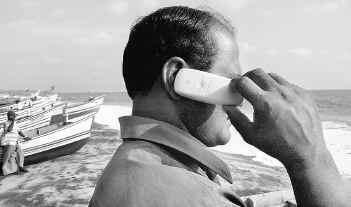 MOBILE PHONES have created a sort of tsunami among certain entrepreneurial groups. The board was hanging from the branch of a tree on the outskirts of Bangalore. It was a computer-printout pasted on cardboard and just mentioned “Manju, the Plumber. Contact **” followed by a ten-digit mobile phone number. Professors are supposed to be infected by curiosity and I decided to try and reach him. I learnt that his income had trebled in the last few months after the acquisition of the mobile phone, thanks to a loan from a friend at six per cent a month. Manju has been getting calls from many customers and is planning to graduate from his cycle to a moped. People who had to call at his home — a one-room tenement — in the mornings to catch him are now able to reach him at all times. He need not worry about losing a customer and having to rush back home during lunch-time to know if anyone had come asking for him. The impact of telecommunication on the self-employed, particularly among the poorer groups, has not been fully understood or appreciated. Mobile phones have created a sort of tsunami among the lower-level entrepreneurial groups, such as plumbers, carpenters, masons, small-time construction contractors, painters, cooks, auto repair mechanics, winders, welders, water-suppliers, tea suppliers, vegetable vendors, other retail traders, tyre-repairers, istri-wallahs (mobile ironing service), flower vendors, auto drivers, priests, astrologers, and so on. Actually, more than three hundred categories of self-employed entrepreneurs use them widely. One of the major forces impacting the financial, labour and product markets is information technology and telecommunication. It seems that, in the long run, telecommunications will be a major competitor to financial institutions as more than 60 per cent of the cost of operations of many global banks is on software and telecom. Around 60 per cent of our economy consists of the service sector, to which the fastest-growing segments belong. They are construction, road transport (both passenger and goods), hotels and restaurants (also dhabhas), wholesale trade and retail trade, and all other types of businesses and services. Each of these activities is growing at more than 7 per cent compounded annual average real growth rate in the last decade, and these are our engines of economic growth. These are the segments where the mobile phone is used widely, as an instrument that enhances market efficiency and raises incomes for entrepreneurs. Markets, whether product or labour or financial, are expected to have information efficiency. Mobile phones enable such efficiency and reduce the opportunities for arbitrage by re-establishing the basic law of one price — namely, assets and services of similar risk characteristics will command the same price, excluding transaction costs. It enables the truck-owner to track the goods that are transported, say, from Kollam to Kota, and provide immediate information on such unforeseen events as accidents and other obstacles, such as check-post harassments. It facilitates price discovery by small-time traders/distributors and helps them decide to send the products to markets where prices are slightly more attractive. It also helps the self-employed plan activities better. A small-time contractor contacts his masons and painters at different work-sites and instructs them instead of travelling to the site on his two-wheeler. The time-value of money has suddenly become the buzzword and, slowly, it enhances the time-consciousness among the self-employed. The mobile phone is now being used for small-time financial activities, such as information on prices, billing settlements, etc. But the important development that service providers and bankers should work towards is to make it drive a retail credit revolution. One observes that in the boat markets of Bangkok, one can either pay by baht, the local currency or get charge cards from the service providers and pay through them. The service providers initially provide an overdraft or revolving credit facility to the retail trader, which is adjusted on a daily basis by crediting the retailer for every debit incurred by the buyer. This is one of the interesting possibilities, wherein the retail trade network is provided a credit facility and which reduces their cost of borrowing. It requires one mobile instrument with them and periodic crediting of their account based on received calls, which are mostly available free . The share of trade, at 15 per cent of the national income (during 2003-2004), was Rs 3.5 lakh crore. Of this, the share of the non-corporate sector (self-employed) was more than 80 per cent, which implies Rs 2.8 crore. At a conservative estimate of 75 per cent of this, the trade sector would have needed Rs 2.1 lakh crore as credit requirements (since, in trade, the major portion of capital is working capital) in that period. The combined financing to trade by all banking sources (both food and non-food credit) was Rs 61,000 crore. This implies that around 30 per cent of credit requirement is met by banking channels and the remaining by non-banking ones. So, the potential available for mobile phone service providers is a market of the order of Rs 1.5 lakh crore for digital-based lending. Even assuming only Rs 50,000 crore of this is tapped in the next, say, five years, at an interest cost of 20 percent (retail credit today in the `open’ market is around 60 per cent) the sum to be earned is Rs 10,000 crore. We can call this digi-financing. Instead of permanently singing the WalMart kirtan, we should think of innovative ways in which technology can facilitate the vast base of self-employed groups. The millions of entrepreneurs involved in the retail trade, instead of being dismissed as “unorganised,” can be made more effective by the credit enhancement and price discovery process simply by using mobile telephony. It is not required for WalMart to come here and squeeze our farmers and small manufacturers and sell their produce/products to consumers at “lower prices”. We can think of leveraging on telecommunications to make all factor markets more efficient and lower consumer prices. The most important thing about the mobile phones is that — unlike computers — even people who are not literate can use them. The only requirement is ability to speak and/or hear. We need not worry about language or massive software development. This small communication device provides phenomenal power unthinkable by economists or financial experts some ten years ago. The appropriate thing to consider is to make the mobile sets free goods for the poorer, self-employed groups. This can be done even through SHGs, wherever they are active, as they may be better able to identify the right beneficiaries. The Central and State governments, as well as various aid organisations, can give the handset free to many in these segments. It must be seen as a process of asset creation and making markets work and should not be condemned, by the metropolitan experts, as a populist scheme. Most of the time, these beneficiaries need to receive calls rather than make them. If we have a market of 500-600 million sets, the unit cost can be brought down to to even less than ten paise. But the Government seems to think that the service sector is the economy’s milch-cow, rather than the engine of India’s growth. It is now to be taxed at 12 per cent, from an earlier 10 per cent, and the Finance Minister’s argument is that their share is more than 50 per cent in our GDP and, hence, they should contribute more. What about agriculture, which constitutes nearly 26 per cent, and the Government, which is around 25 per cent? How much do they contribute? The aim of the Government seems to be to destroy the entrepreneurial spirit and growth process of the service sector by expropriating as much as possible from them for the unproductive activities of the Government. This is exactly what happened due to the socialist policies of the 1960s in agriculture and manufacturing. Let us not repeat it in the service sector. Since the growth in the economy is not due to the Government but in spite of it, the least it can do is to allow million Manjus to flourish for a vibrant and sustained growth process.